This recipe uses a fresh unpasturised sheep’s curd made by Homewood Cheese, it’s wonderfully fresh and creamy and therefore perfect for this recipe. If you can’t get hold of ewe’s curd however you could use ricotta instead. Simply pop the strands into the rum and leave to infuse for a minimum of 2 days. I’ve said use 250ml rum as it keeps forever and just gets better with time so it’s there for the next time, it’s also amazing in cocktails! Place your sultanas in a cup and pour over the smoked tea rum making sure all the sultanas are covered. Cover the cup with cling film and leave to infuse for 3 days. This may seem a long time but after 3 days the sultanas will be so plump that they pop when you bite into them releasing a burst of flavour. Take a clean sprig of rosemary and push it into the centre of your jar of stem ginger and syrup in order to infuse. Dip the remaining sprigs of rosemary into the egg white, then using a small sieve (a tea strainer is perfect) gently dust the rosemary with the caster sugar, coating evenly but lightly. Lay the sprigs gently on a baking sheet and leave overnight in an airing cupboard in order for it to crystallise. Crush the stem ginger biscuits and add the melted butter. Stir to combine then divide the mixture between 4 glasses and push down gently to even off using the back of a spoon. Pop into the fridge to set whilst you make the next layer. Whip your cream until it will happily stay stuck to a spoon when held upside down. Stir in in the sheep’s curd and make sure it is evenly mixed then stir in the sultanas and rum. 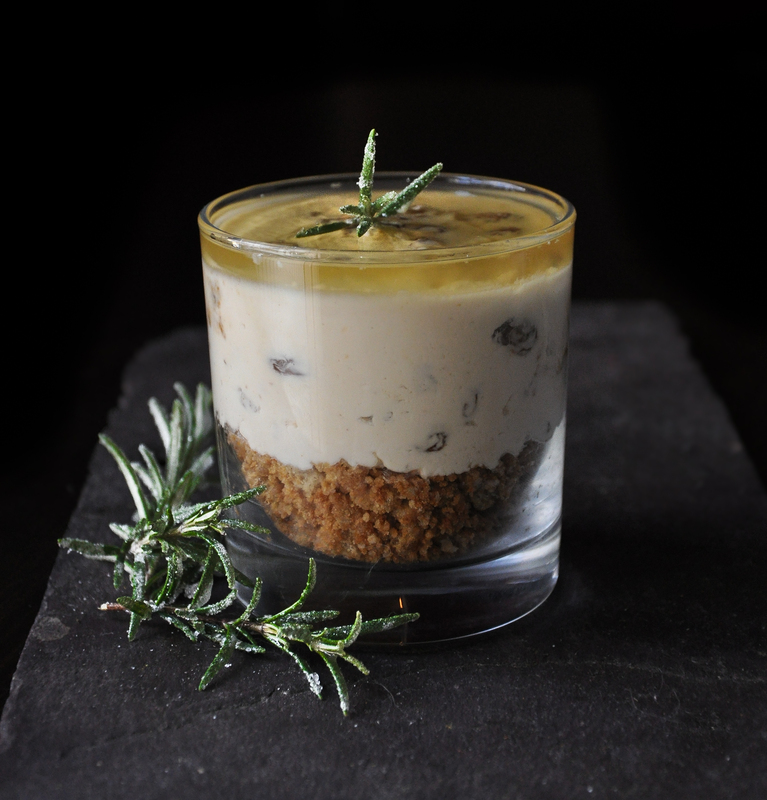 Take your glasses out of the fridge and divide the mixture between them carefully pushing the cream down onto the biscuit base to avoid air gaps and leaving room at the top for a layer of rosemary ginger syrup. Pour over the syrup then top each dessert with a small sprig of rosemary. The beauty of making these in glasses is that as your spoon travels through the layers you pick up all the flavours, and its a lot less faff than using dessert rings!